Have A Question About Housing? Try these links for answers. Do you ever have questions regarding housing but are unsure where you can get answers? Below we have included some useful links that include valuable information about housing. At the Housing Court Answers website, you can find helpful information related to most housing issues, such as eviction, landlord harassment, how to make a complaint, what to expect if you have to go to housing court, and much more. Remember, you don’t have to be going to housing court to find this information helpful, much of the information available on this site is to help you avoid getting to the point where you have to attend housing court. Visit: http://cwtfhc.org/ to access the Housing Court Answers website. Another helpful link is the New York City Department of Buildings website. If you’re wondering what past and current violations your building has, you can easily find the answer by typing in the address and borough. For example, if you’re wondering if someone else in your building isn’t getting hot water like you, this will help to show if any complaints have been made. If nobody has made a complaint, maybe you need to be the first one in order to spur on action from others in your building. An additional helpful feature of this website is the box you can click that takes you straight to the 311 website. You can file a complaint on the 311 website regarding almost all housing issues (if not, don’t forget about the previous website we talked about). Visit: http://www1.nyc.gov/site/buildings/index.page to access the New York City Department of Buildings website. Last, but certainly not least, you can visit the website of Housing Conservation Coordinators (HCC). You will be able to learn more about how to take part in a free legal clinic held at the office, including what you need to fill out, what you need to bring, and what hours the intake process takes place, so you can get a chance to speak with an attorney one-on-one to discuss what situation you might be going through. You will also find their phone number (212) 541-5996 and their contact e-mail (info@hcc-nyc.org) in case you’re not paying attention to my typing and just want to click on the blue stuff. 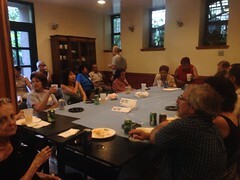 Visit: http://www.hcc-nyc.org/ to access the Housing Conservation Coordinators website.